45 Hereford is located on the west side of Hereford, between Commonwealth and Newbury, with 314 Commonwealth to the north, across Alley 430, and 47 Hereford the south. 45 Hereford was designed by Bradlee and Winslow, architects, and built in 1882 by Vinal and Dodge, masons. It is one of five contiguous houses (45-47-49-51-53 Hereford) they built for speculative sale in association with building contractor George Wheatland, Jr. He is shown as the owner on the original building application for all five houses, dated February 24, 1882. 47-53 Hereford are designed as a symmetrical composition, somewhat unbalanced by 45 Hereford. Click here for an index to the deeds for 45 Hereford. On November 8, 1882, 45 Hereford was purchased from Warren D. Vinal and Charles A. Dodge by Clara Elizabeth (Robison) Macomber, the wife of insurance agent Frank Gair Macomber. They previously had lived in Newton Centre. They continued to live at 45 Hereford during the 1886-1887 winter season, but moved thereafter to a new home they had built at 463 Beacon. In 1887, 45 Hereford was the home of Charles Albert Read, Jr., and his wife, Ellen Arvilla (Hatfield) Read. They were living there at the time of the birth of their son, Charles, in June of 1887. Their principal residence was in Manchester. On May 13, 1887, 45 Hereford was purchased from Clara Elizabeth Macomber by real estate broker James Morris Meredith. He was unmarried. He continued to lived there during the 1891-1892 season, but moved thereafter to 88 Beacon. During the 1892-1893 winter season, 45 Hereford was the home of wholesale dry goods merchant Warren Mason Whiting. a widower, and his young children: Mason Tuxbury Whiting, Louise Whiting, and Warren Mason Whiting., Jr His wife, Emily (Tuxbury) Whiting had died in June of 1892. At the time of her death, they lived at 333 Beacon, the home of her mother, Harriet Matilda (Beals) Tuxbury, the widow of George William Tuxbury. By mid-1893, Warren Whiting and his children had moved to Weston. 45 Hereford was not listed in the 1894 Blue Book. On September 19, 1894, 45 Beacon was purchased from J. Morris Meredith by Charles J. Lynch. He and his wife, Anna M. (Kane) Lynch, made it their home. They previously had lived at 50 Poplar. Charles Lynch was a retail liquor merchant until about 1900, when he became a real estate dealer. Charles Lynch died in May of 1917. Anna Lynch continued to live at 45 Hereford with their two children, Maurice B. Lynch, a lawyer, and Maude A. Lynch, a kindergarten teacher. Anna Lynch died in March of 1931. Maurice and Maude Lynch continued to live at 45 Hereford. 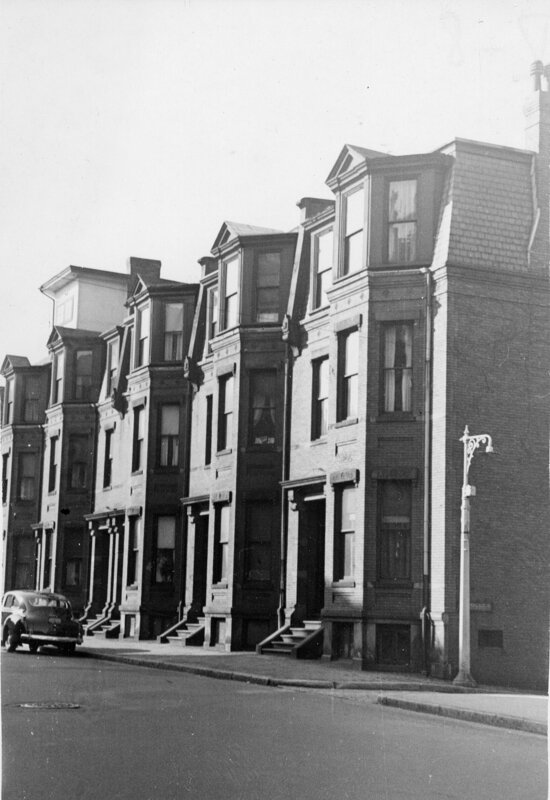 On June 18, 1935, the City of Boston filed a tax lien on 45 Hereford, and on September 10, 1940, the Land Court granted the City of Boston’s petition to take possession of the property in foreclosure of the tax lien. 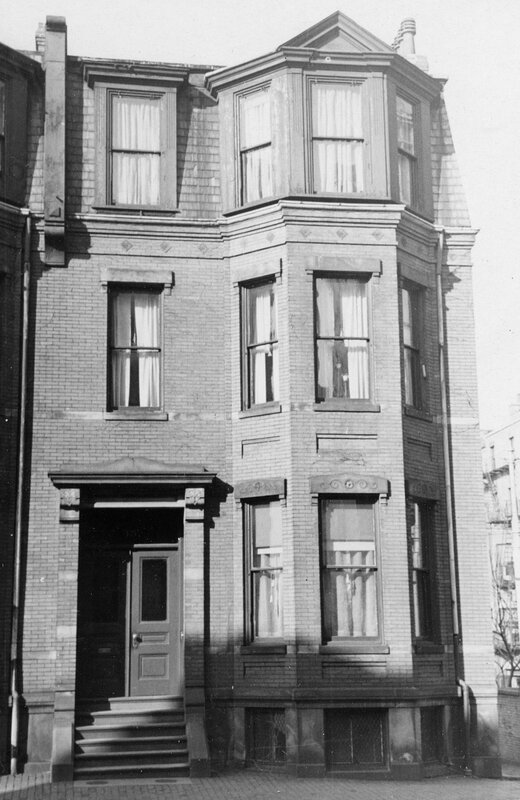 Maurice and Maude Lynch continued to live there until about 1947, when they moved to 33 Gloucester. On October 31, 1946, 45 Hereford was acquired from the City by attorney Edward H. McGrath, Jr.. He and his wife, Joan (McLaughlin) McGrath, made it their home. They previously had lived in Brookline. Edward McGrath was a lawyer and, in 1950, was appointed commissioner of Massachusetts’s state-owned airports. 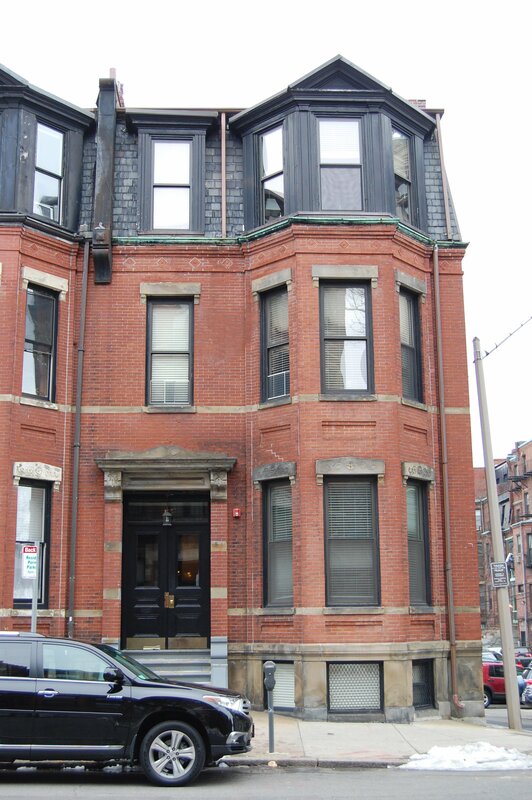 The McGraths continued to live at 45 Hereford until 1951, when they moved back to Brookline. On October 24, 1951, 45 Hereford was purchased from Edward McGrath by John Breining and his wife, Ruth Y. (Allen) Breining. They previously had lived in Revere. They operated Miss Allen’s Modeling and Finishing School at 45 Hereford. They continued to live and operate the school at 45 Hereford until about 1956. In September of 1956, they applied to legalize the occupancy as a school and photo studio. The application was denied and they appear not to have appealed the denial. In April of 1957, they purchased 135 Commonwealth, where they moved the school, renamed as the Back Bay Modeling Academy. By that time, they made their home in Cohasset. 45 Hereford was shown as vacant in the 1958 City Directory. On May 29, 1957, 45 Hereford was purchased from the Breinings by William Burnham Bryant, an engineer, and his wife, Lucia (Mazurek) Bryant. They previously had lived in an apartment at 458 Beacon. Lucia Bryant died in November of 1977, in an automobile accident. William Bryant continued to live at 45 Hereford. In 1984, he married again to Sally Ruth Wilcken. On July 2, 1986, 45 Hereford was purchased from William Bryant by John Sarno, trustee of the 45 Hereford Realty Trust. 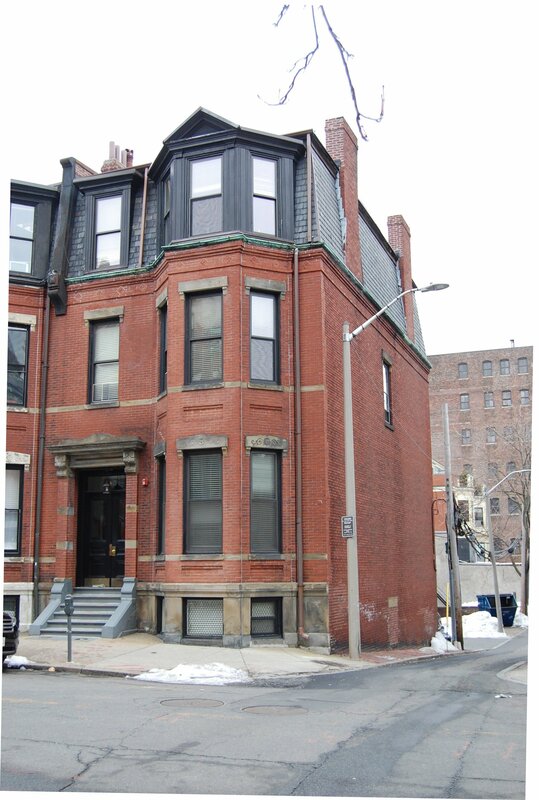 In March of 1994, Charles C. Patsos, successor trustee of 45 Hereford Realty Trust, filed for (and subsequently received) permission to convert the property from a single-family dwelling into four apartments. In his application, he indicated that this was an existing condition. On February 23, 1999, 45 Hereford was acquired from Charles Patsos by the 45 Hereford Street LLC (Neil G. Glynn, manager). 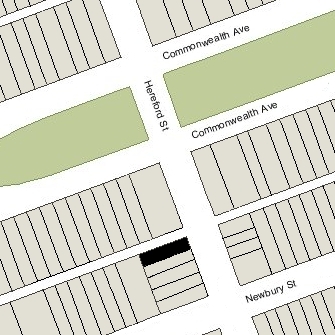 45 Hereford remained an apartment building, assessed as a four- to six-family dwelling, in 2015.